No sleeping in today, DH & I have a golf date this morning. Amazingly the kids are showing signs of life, I really thought they’d sleep a bit longer. That’s ok, it lets us lay down the ground rules with them. The last few trips we’ve let them wander/hang out around the resort while we played golf, this time, they’re getting a little more freedom. Since DD has done so well, and we’re “next to” Epcot, we’re giving them the option to go to the park this morning. They must stay together, no fighting, and if either one wants to leave, they both leave. It’s really amazing how much better they seem to get along, when we’re not around! The valet pulls my truck around front and DH & I are off to play our “home course”, LBV (Lake Bueana Vista Golf Course at Saratoga Springs Resort). We had really wanted to play here in June, but they closed the course a couple of weeks before our trip to redo the greens & tee boxes. So now we get to play on a brand new course. It’s a very pretty course, I wish my golf game matched it. 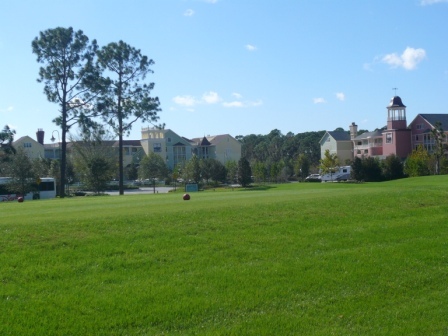 The cousre starts at Saratoga Springs Resort, winds thru Old Key West Resort and even comes up by Port Orleans Resort. Let’s just say what little ability/talent I do have, seems to have been on vacation today. The only good hole was the one I was most scared of. There is a beautiful par 3, Island Green (#6 or 7) I have a mental block when it comes to water on the golf course, I usually tend to land in it. Disney Magic time! 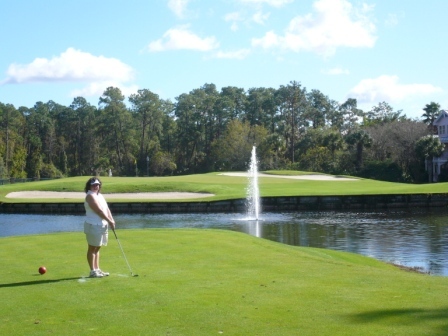 I clear the water ……….. and land in the sand trap short of the green ……but the Disney Magic came back and I had a great shot out of the sand with a short putt for par. I don’t get many pars when I play, so this was a good hole! It was a great morning; the weather was fantastic, the course was beautiful and the company was perfect. The kids seemed to be having a good time. Throughout our golf round we got text messages and pictures of where they were. They rode Test Track (again) Mission Space Orange, Soarin’, Maelstrom & Grand Fiesta Tour (boat ride in Mexico, better but still not good) on their way back to Boardwalk Villas they stopped at the Beach Club and got themselves lunch at Hurricane Hannah’s, then hung out at BWV’s Community Hall. We all met back at the room around 3:30pm and headed down to Luna pool. Today was our warmest day so I had promised we could go to the pool and they could tryout the Scary Clown Slide. I managed to make it to the hot tub and hoped that a Captain’s Mai Tai would make me feel better … It helped a little . DH & the kids tried out the slide and said it was “ok”. We were all surpised at how small the pool actually was, from the walkway & pictures it had looked bigger . The Luna hot tub is bigger than the quiet pools’, but wasn’t as hot. It was more like a “warm tub” which wasn’t all that enjoyable for me. Dad called to let me know they made it back home. Their flight had been delayed out of Sanford, so getting up so early was for nothing. Unfortunately Jackies cat was sick when they got home and a family friend has passed away so as soon as they got back, they were at the vet and the funeral home for the visitation. Not the best way to end a vacation, but he said they had a wonderful time with us at Disney. I had told Dad and Jackie to get 4 day passes. We got them tickets to Mickey’s Very Merry Christmas Party as a Christmas gift. That took care of them for their 5 day trip. The morning was spent fairly quiet and seperate. Everyone needed a little downtime and space. Dad & Jackie were going to Downtown Disney and maybe the pool at SSR. DH & DS went to play golf at Disney’s Oak Trail. –It’s the family walking course, we played there last year. It’s nice, but not on the same level as the “real” courses on site. — DD surprised us and was up early. Don’t see that often! I really just wanted to rest and relax, so I’d be ready for the party. She wanted to go ride Test Track again. So, I took a deep breath and let her go to Epcot by herself. She’s gone in by herself and met us, but never went by herself for the whole time, so I was a little nervous, but she did fine. I kept getting text messages, “single rider line, no wait” “Here now….” She’s actually pretty good about keeping in touch, and she was having a blast! I drank my coffee and then wandered thru the shops at the Boardwalk. Around 11ish, I met up with DD on her way back from Epcot. –Now, before our trip, I had been reading/posting on other trip reports & pre-trippies on the Disboards. Apriateslife4evr was going to be at Boardwalk Villas some of the same dates, and going to some of the same places, so I had kept an eye out for her & her parents all week. –DD and I are walking down the boardwalk and I see a lime green tag on a bag. The girl has a “katie holmes/posh spice” haircut & 2 older people are sitting on a bench with her. Only in Disney World can this happen, but I walk up and ask “Are you Donna?” she says yes and I tell her who I am. I’m now getting a hug from a “friend” that I’ve only just now met in person. We talk for a little bit, she’s actually getting ready to go home but it was really neat to catch up. So here’s my shout out to the disboards, this place is so cool! DH & DS are back now, so we meet up back in the room. They’re tired but had fun. Time to relax for a little while, then off to Saratoga Springs Resort to meet Dad & Jackie. We have a late lunch Advanced Dining Reservation at Turf Club (2:45pm) and then we’ll go check out the Grand Floridian before going to the Christmas Party. Sometimes Disney transportation can drive you nuts. Give yourself lot’s of extra time, and you get where you’re going way to early; cut it a little close and the bus you need will have just pulled away We caught a bus to DTD and thought we’d save our feet and catch a bus to SSR. As our DTD bus pulled in, we saw the SSR bus leave, so we walked quickly over to Dad & Jackies room. Met them outside and walked over to Turf Club for lunch just a little late. No problem, we were seated within minutes and for the longest time I think we were the only people there. We had several good meals here in June, so we were looking forward to this one as well. We started by treating DS to the Pirate Punch w/Captain Hook clip on light so he could have something special Jackie and I had the crab cakes, Dad had the onion rings, DH had the calamari and DD had the buffalo chicken strips. All of them were very good, and large! DD ended up sharing with DS who decided to try them. He liked them, but I’m guessing they were pretty “hot”, he was getting pretty sniffly. Sinuses were definitely clearing! Really those appetizers could have been a meal, but now it was time to order our entrees. Dad had the angus chuck cheeseburger, DH had the ribeye steak sandwich, DD had the reuben and Jackie & I had the same thing again, the penne pasta with shrimp. All were very good, although DD said the reuben wasn’t as good as it had been this summer. It may have had something to do with the appetizer filling her up, but who knows Everyone is full and I mention that we still get dessert. Gotta love the Disney Dining Plan! While we wait, Dad & DS go shoot pool and have a little fun. Dad had the individual apple pie, DH decided that the mixed berries would be good after such a filling meal, DD got the cheesecake and gave her daddy the berries that came with (she doesn’t do veggies or fruit) Jackie & I finished ordering the same meal with the chocolate lava cake. Yummy Yummy Yummy! If you like chocolate, you have to try this! Did I mention this was Yummy! We rolled out of the Turf Club, and made our way to the bus stop. Next stop, Magic Kingdom. The plan for today is Epcot in the morning, Le Cellier for lunch and meet Dad & Jackie when they arrive at Disney’s Saratoga Springs Resort in the afternoon to help them check in and get a feel for Disney transportation. Get Counter Service dinner and head to the Studios for Extra Magic Hours. Dad and Jackie were getting 4 day non-park hopper passes, so EMH would let them get the most park time for the 1st day of the tickets. We love Epcot and tend to spend most of our time there on trips. So much so, that we tend to wander and I don’t always remember what we did when, because we’ve done it all so many times. I know we went on Soarin, and we asked to wait to ride center, top row. Wow! I love this ride anyways, but it was really cool to be all the way up with no feet above my head. And the oranges, ooh I love the smell of the oranges! I think we went to see Figment that morning too. We like to sing along through the ride, so if you heard us, sorry if we were out of tune. We had an early lunch at Le Cellier in Canada. This was one of the reasons we decided to do the Disney Dining Plan. We almost always have lunch here and always want to get the filet, but then look at the prices and end up having the steak sandwich instead (which is very good, but not a filet) so we were really excited about this lunch. Our waitress was very good, helped DS customize his kids meal so he could have all the things he wanted and feel like he was having as much stuff as we were. DH, DD & I all had the same things until dessert time. Cheddar Cheese soup (YUM! ), and the 5oz filet. DH had gone to the restroom and of course that’s when the food arrived. I waited for a minute, then decided I needed to make sure it was cooked right. DD was again enjoying her fine dining experience and so that DS wouldn’t feel left out, I offered him a bite of mine. I told him to let it sit in his mouth a minute and then I saw that look on his face … My baby is growing up. He’s now decided that he really likes filet and that if his dad isn’t back in a minute, he’s gonna eat his filet! Thankfully DH got back in time and didn’t lose out on his filet. We decided to all order different desserts so we could try as many as possible. DH had the creme brulee (which DS decided was his new favorite dessert), DD had the chocolate whiskey cake (very good) and even though I’m the chocoholic in the family, I had the apple crumble so we’d have something different to try. It was very good, but I’d have preferred the chocolate. It was a fantastic meal, and when DH saw the bill, he decided he really liked the DDP! I don’t remember what we did next, we were waiting to hear from Dad & Jackie. They were flying out of Lansing MI at 10:50am and were supposed to land at 1:15pm in Sanford, unfortunately they got a bunch of snow Saturday night in Lansing so their flight was delayed. They finally landed around 3pm and were taking a shuttle to Saratoga Springs Resort, so we left Epcot and headed over to Saratoga Springs Resort to meet them there. I have to explain here that Dad has only been to Disney twice in his life, one day at Magic Kingdom in 1983 and one day at Epcot in 1987. Same for Jackie, so they have no idea what to expect, I tried to tell them but until you see for yourself…. They made great time from Sanford and just after 4pm we met them in the lobby at Saratoga Springs Resort. I helped them check in, got their tickets put on the room key(they got park hoppers, that’ll come in handy later on), made sure the room request was there (it was), made sure the Disney Dining Plan was set (it was) and the Cast Member gave them 1st Trip buttons. All set, we take them to their room in Congress Park, I think they’re impressed (I hope so!) Now we show them the walk over to Down Town Disney, so they can learn where to catch the resort busses to meet us later in the week. We figured on Counter Service dinner here, we looked at Wolfgang Puck Express, then decided on Earl of Sandwich. Only problem is that my family isn’t hungry yet after that lunch at Le Cellier. So dad & Jackie eat while we watch and tell them about our trip so far and tonights plan. Now we catch a bus to our room at Boardwalk Villas and then a Friendship to the Studios, of course it’s dark now so they’re not really seeing much. 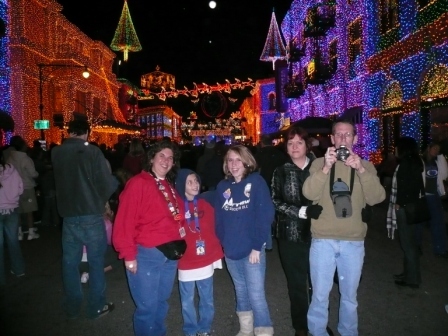 It’s time to see the Osborne Lights, I’ve been looking forward to this for a long time. Wow! Dad & Jackie are amazed (ok, good start here) Did I mention Wow! So amazing, if you get the chance, go see this! Now DS wants to go on one of his favorite rides, Star Tours. We decided that it was just too bumpy for Dad to go on with his back, but Jackie is a trooper and goes with the kids. Jackie & the kids finish the ride, they had a good time even though Jackie gets motion sickness (I didn’t know! If I had , I would have told the kids to go alone). But she said she really enjoyed it. It’s really starting to get cold and my family is finally getting hungry, so are Dad & Jackie. We went to the Commissary and all got Counter Service. It was ok, nothing special, not horrible (except for the burgers, they weren’t good). We went and saw Muppet Vision (love that!) and then we went to the Great Movie Ride. We had heard the wait was an hour earlier, but it was down now. We walked right in, but waited in the movie room for a couple of rotations. This was the first of funny dad moments. After waiting through the pre show, when we were finally going in to the ride he says that the movie clips are good, but he can’t understand a 1 hour wait to see that. Oh dad, that’s the pre-show, we’re going on the real ride now. That he really enjoyed and thought was worth a wait, maybe not an hour, but worth a wait. It’s late now, and everyone is tired. We head out and explain where to catch the bus, and a quick explanation of how to catch a bus to the Studios in the morning and take the Friendship boat to Boardwalk Villas to meet us for our breakfast ADR. Ok, they’re off to catch a bus, and we catch a boat. Not bad for the first day. I think they’re having fun (I tend to worry about things like that, a lot) now it’s time to relax and go get warm. It’s really getting cold! Allright, it’s Friday Dec 14th and the plan is to hit the road after DH gets home from work and hopefully get to the Jacksonville area for the night. It was an uneventful drive, just sat back and listened to our Dis Unplugged podcasts that we had been saving up. Made it to J’ville, stopped for the night and got back on the road around 9am Saturday. 10:30am and we’re here!!!! Drop our luggage with bell services and go to check in. Our room isn’t ready yet, so we head over to Epcot International Gateway to get our Annual Passes and then we start wandering around the world. We played around a bit, got Test Track Fast Passes, and then got our first meal on the DDP (Disney Dining Plan) Counter Service at Electric Umbrealla. I have to say I was really surprised, the food was really good and there was a lot of it! DH & DS (who was really hungry) got the Dbl Cheeseburger Combo, Coke & cookies, I got the chicken sandwich combo, coke & cookies, DD got the chicken strip combo, coke & cookies. Since there were 2 cookies in each package and we were pretty full, we each had a cookie and saved the rest for later. We went on Ellen’s Energy Adventure (45 minutes to rest, love that!) then Test Track. The excitement energy is wearing off and the travel is catching up with everyone so it’s time to head back to the Boardwalk Villas and see if our room is ready. It’s about 3:45pm and we get our room #3093 almost at the end of the hall near the stairs. Everything looks great, the view is of the quiet pool & community hall. We get our luggage brought up and the DH & I tell the kids to relax, we’re going to get groceries. Ok, the kids don’t know, but back in late July/early Aug after making our ressies, I signed up for the Disboards DVC Tree Exchange. Because of scheduling changes with the trees, we had to go over to Disney’s Old Key West resort to pick up our Christmas tree. I called ahead and bell services was going to get the tree and have it ready for me. I get there, no tree. Lavelle (OKW Bell Services) was fantastic, he looked & looked, then brought me & DH back into the storage room to look, then called the family on the tree that was in storage to see if they had gotten the wrong tree. In the end, we left with Lavelle promising to keep trying, but no tree. On a whim, when we got back to Boardwalk Villas, I checked with Bell Services and there it was!!! The previous family had it transferred over to BWV to make it easier for us, lol. 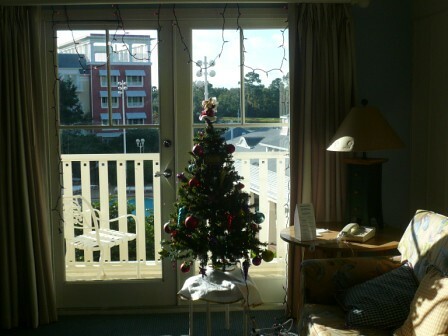 Now all is right with the world and I get to surprise the kids with a Christmas tree and balcony lights for our stay. We got the tree decorated, and hung the lights from the curtain rod so they could be plugged in while we were out of the room. If anyone saw the pink lights, that was us! It’s time to head out for the meal we’ve been looking forward to for months: Hollywood Brown Derby. We have a 7:50pm ADR (Advanced Dining Reservation), and the park closes at 8pm. The Friendships were out of synch & slow, but we made it. When we checked in, DD went to the desk and quietly asked if DS could get a phone call. This is something they do if you ask, and relates to the history of the restaurant, before the days of cell phones. We get seated almost immediately and hostess comes over to talk to DD. Normally they’ll seat you at a booth where the phone can be plugged in, but our table got assigned before the phone request went in, so DD is told they’ll do the best they can. We decided not to use the DDP with this meal because it is a 2TS (Table Service credit) meal. 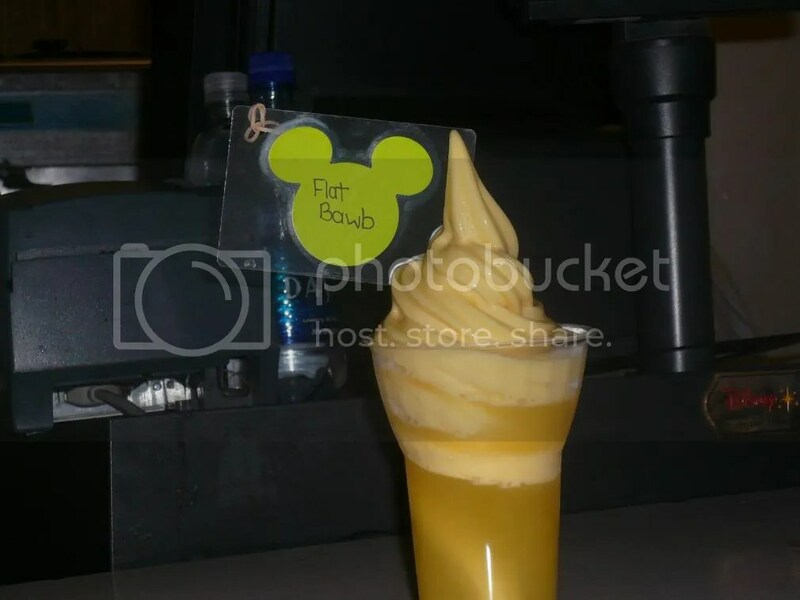 We also have the Disney Dining Experience card and used that instead. We ordered the incredible Cobb Salad for 2. The kids didn’t bother with appetizers. The hostess came over to DS and told him that they had a “very important phone call” for him and would he please follow her to the phone. So off he went, looking a little tired and very confused! Goofy was on the phone with him and asked him to meet later by the theater. The hostess then told DS that he must be very important, because she’s worked at Disney for a very long time and Goofy has never called her!!! Now the salad came and disappeared pretty quickly. Time to order dinner: DH & I both had the salmon, DD ordered the rotisserie chicken that she loves and DS ordered his hot dog off the kids menu. Here’s where DD starts to grow up, our waitress came back and apologized but they were out of the chicken. Now, DD has never been real adventurous but our waitress recommended the Roasted Hatfield Pork Rib Chop and said she would serve it with the sides that come with the chicken. DD agreed to try it and that was the best decision she’s made in a long time! I have never seen a pork chop like this, it was at least an 1 1/2 thick. She took the first bite and I swear it was one of those “priceless” commercials. I wish I had taken a picture! It was the most tender, delicious piece of meat, just like a fine filet. It melted on your tongue. DH & I each got a small bite, the rest she polished off like she had never eaten before. Oh Oh, she’s now developing a taste for fine food, as if teenagers aren’t expensive enough?! Desserts were also fantastic, flourless chocolate torte for me, grapefruit cake for DH and pumpkin cheesecake for DD. DS had his favorite “Hidden Treasures”. What an amazing, outstanding meal. The food, the service, everything was excellent! We left and took the walkway “home” to BWV. We were too full to be crowded onto the last boat of the night and needed to walk off dinner. There’s our room, I see the pink lights! We had a great day. Tomorrow we’re off to Epcot, lunch at Le Cellier (another favorite) and then Dad & Jackie will be arriving in the afternoon. Time to sleep and get ready for a busy day.